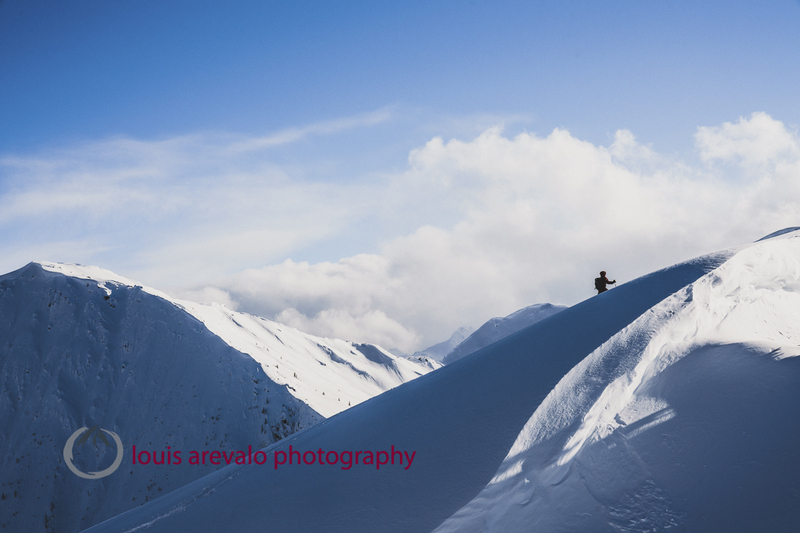 The two days before the April 2015 storm had been perfect—sunny skies, stable snow and endless Tordrillo spines. On the third day, the wind began to blow and the skies grew overcast. Spouses Zach and Cindi Grant, along with longtime friend Kelly Gray, went to work, digging a cave and building walls around camp, later taking turns shoveling and listening to avalanches when the snow began to fall. On the sixth day, an aircraft was dispatched to retrieve them, but there was a problem—the soft landing and takeoff conditions required a lighter plane, a Super Cub, with room for only one passenger. And in this case, there was only time for one trip during the break in the weather. At first Kelly insisted Cindi go, but when the bush plane lurched upward into the clouds, Kelly was aboard, leaving Cindi committedly standing beside Zach on the Triumvirate Glacier, hoping the weather would hold. “They’ve been like that ever since the beginning,” says Sheila Roller, Cindi’s mom. In 2001, when Zach and Cindi, met as high-school freshman in the Salt Lake suburbs, Sheila was concerned with how inseparable they were. Over time her concern has faded as she’s realized just how aligned they are. And what started as a friendship became an affair that revolved around snowboarding. 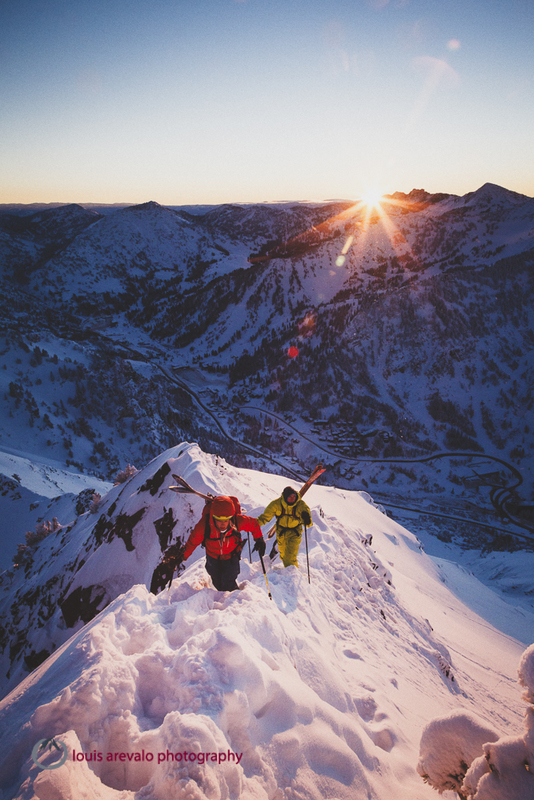 The duo began exploring the Brighton and Snowboard sidecountry in high school, but their interest in riding backcountry lines became ignited while attending Salt Lake Community College. 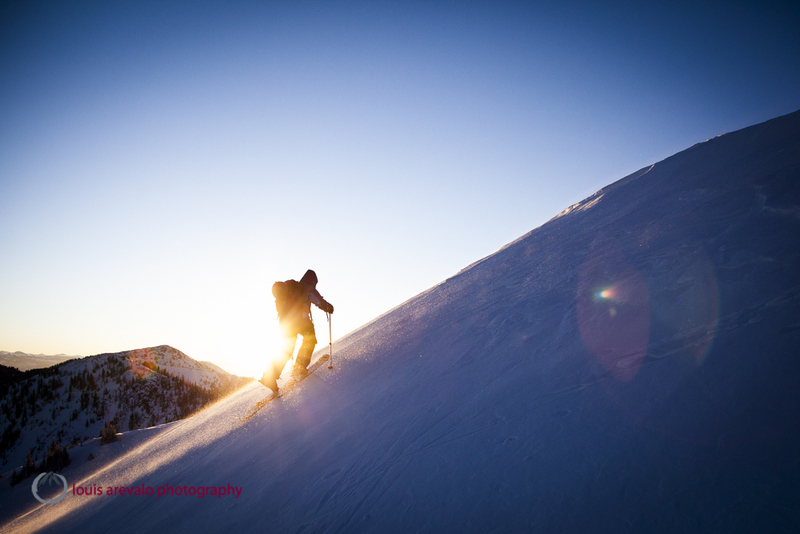 Back to the Wasatch the couple settled into careers – Cindi as a programs director of a guide service and Zach signed on to a trails and grooming crew at a local resort – that maximized their time on snow. 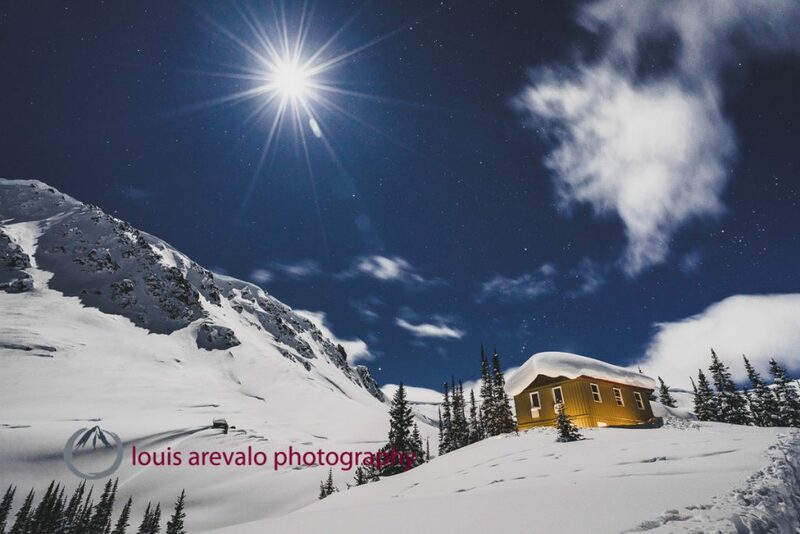 In summer 2012, they purchased a backcountry cabin that was in bad shape and had no running water but was located in a basin surrounded by backcountry terrain. With the help of friends and family, they rebuilt. “Someone once told me that if your marriage can survive a remodel, then you have a solid relationship,” Cindi says. “It was definitely a test,” admits Zach, “that took us back to the fundamentals where we had to focus on communication and working as a team.” Four years later their simple shed-frame home, nestled off unimproved roads, has running water, is filled with natural light and beckons visitors to rethink their city lives. 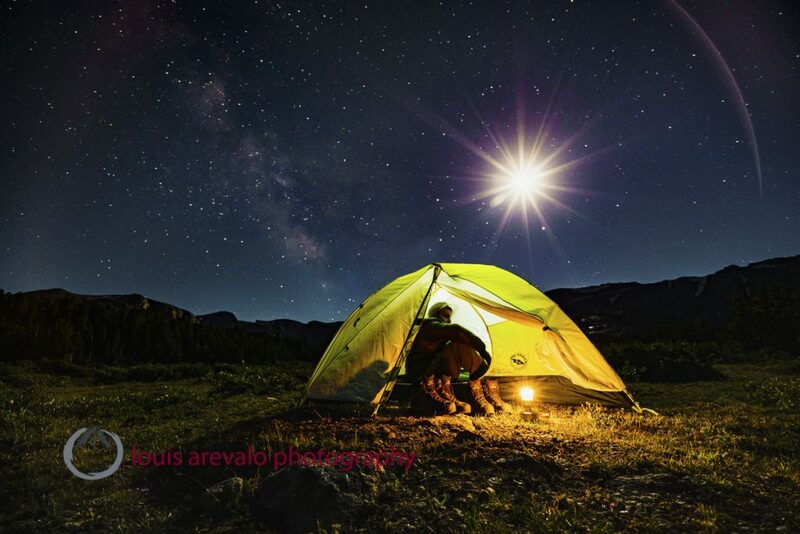 Moon Star camp, Stough Creek Basin, Wind River Range, Wyoming. “Louie, you should try and make it look like you’re actually doing the activity. 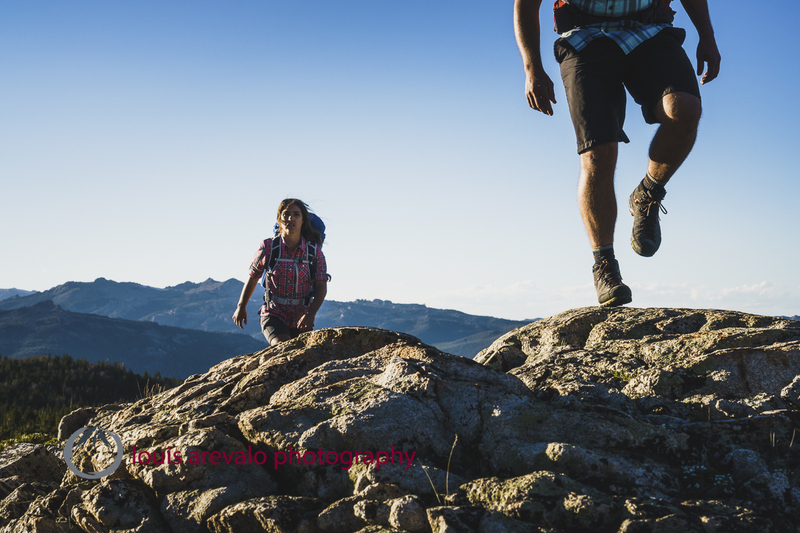 If it’s camping make it look like you’re actually camping, if you’re running make it look like you’re really running…” Five years ago I received this advice from a friend who had been working in the outdoor industry for nearly 30 years. I believe he was talking about authenticity and not suggesting my work was too staged, unbelievable, and ultimately, shallow… err, at least I hope he wasn’t. 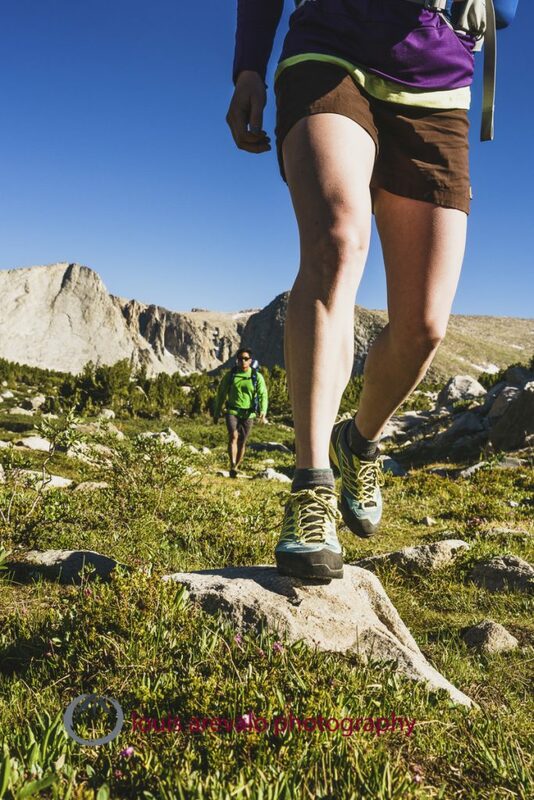 Kaitlyn Honnold and Chris Call explore Stough Creek Basin, Wind River Range, Wyoming. Fast forward to July 2016. 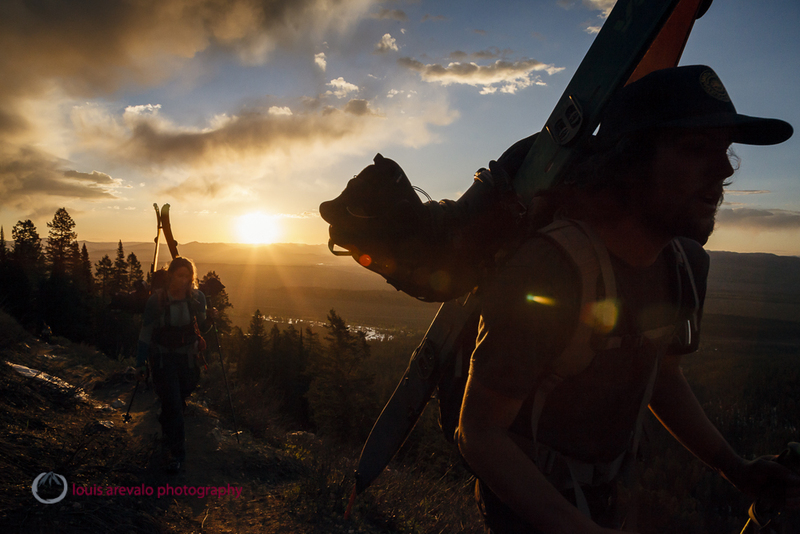 The Scarpa North America team had hatched a plan to create new backpacking imagery for their 2017 season. 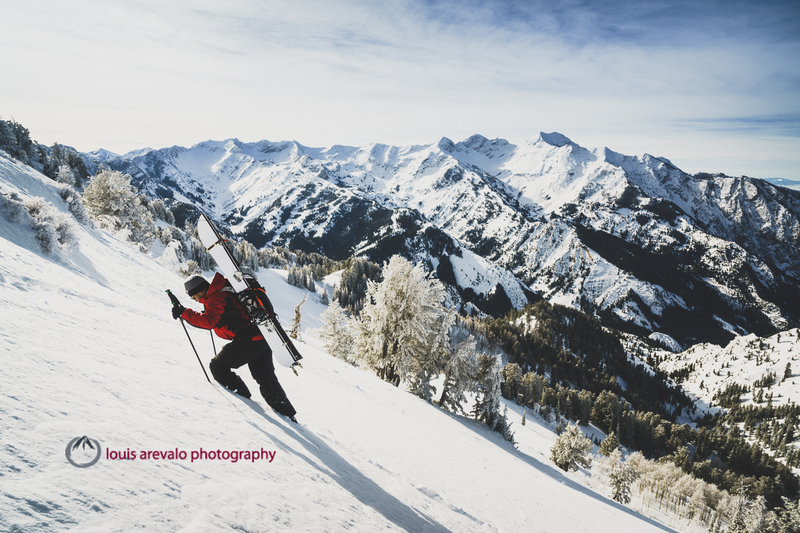 Being big proponents of authenticity the plan was basic – go backpacking in the Wind River Range of Wyoming and make photos of people using their products in the field. 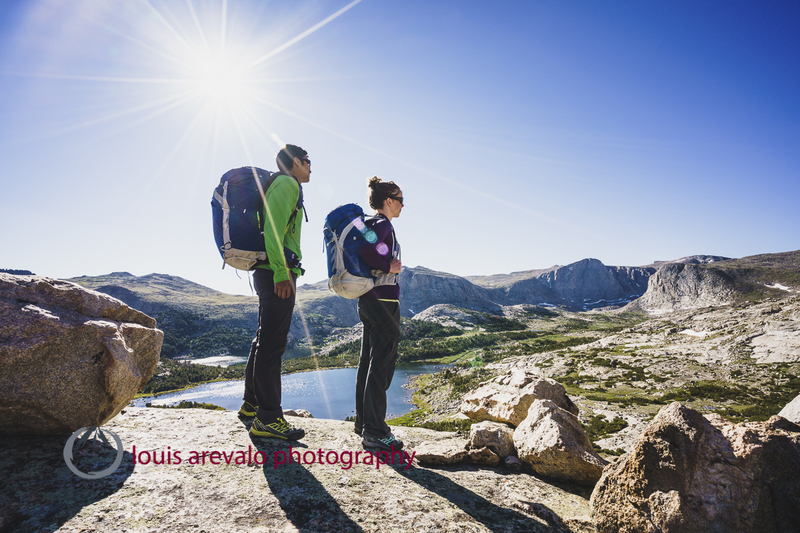 Backpackers Alexa Ault and Kevin Luby explore the Stough Lakes area of the Wind River Range, Wyoming. Above it all. Backpackers Chris Call and Kailtyn Honnold soak up the view of Stough Creek Basin, Wind River Range, Wyoming. 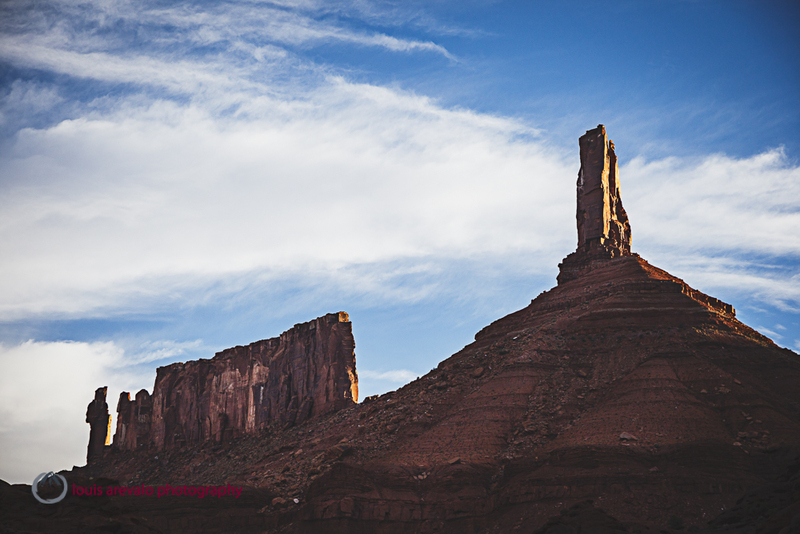 Kissing Couple Spire (Bell Tower), Monument Valley, Colorado National Monument. Desert sand, springtime lightning, rolling thunder, hail, then cold rain. 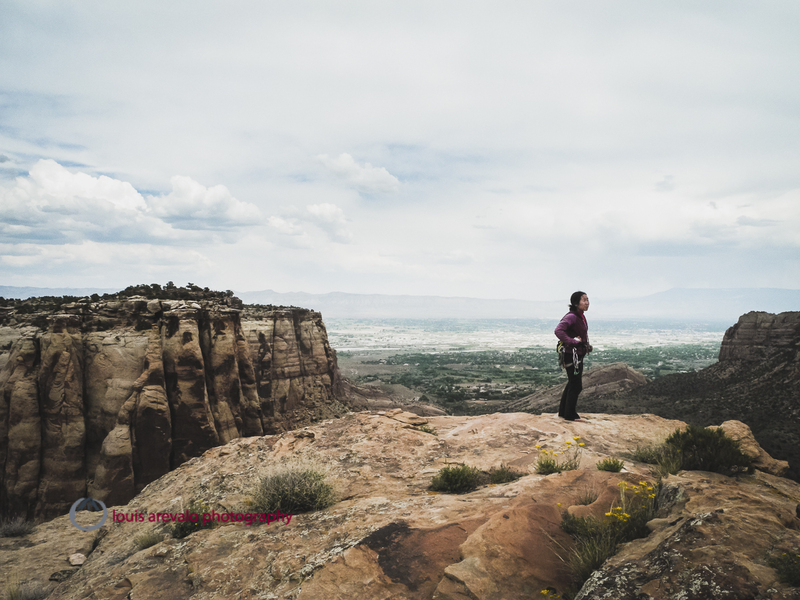 Shiho Kobayashi enjoys the view from the summit of Independence Monument, Colorado National Monument. 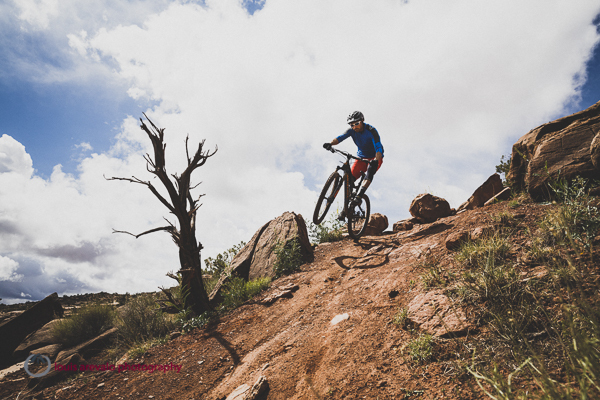 Dirty hands, sore muscles, and big smiles. 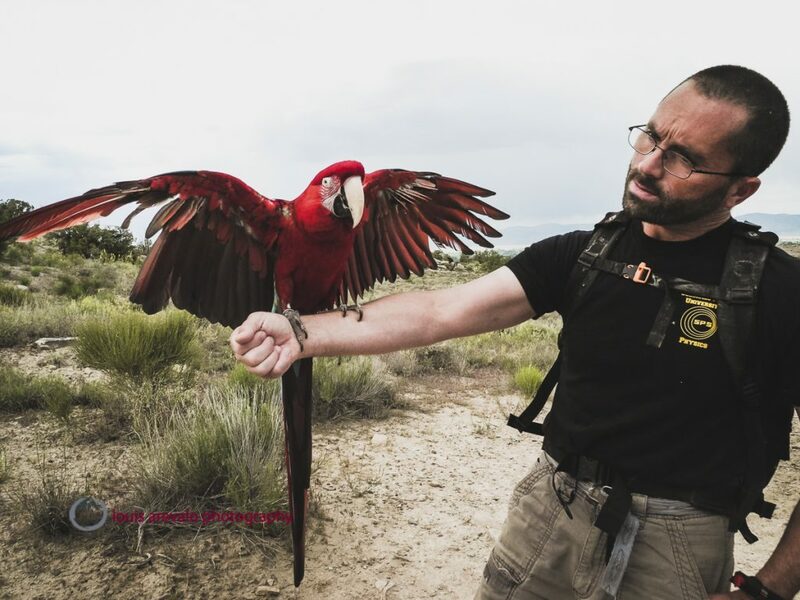 Hairy scorpions, collared lizards, then injured macaws. 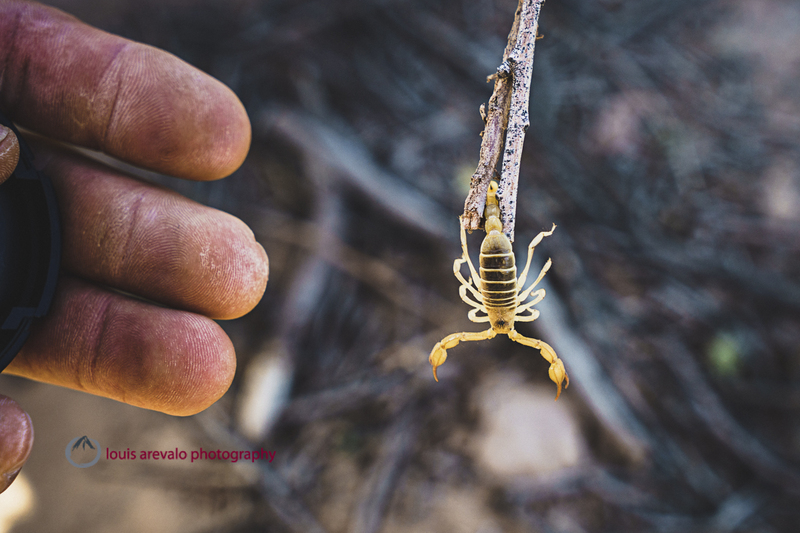 Northern Desert Hairy Scorpion, Colorado National Monument. Ariel the macaw out for a walk in Colorado National Monument. 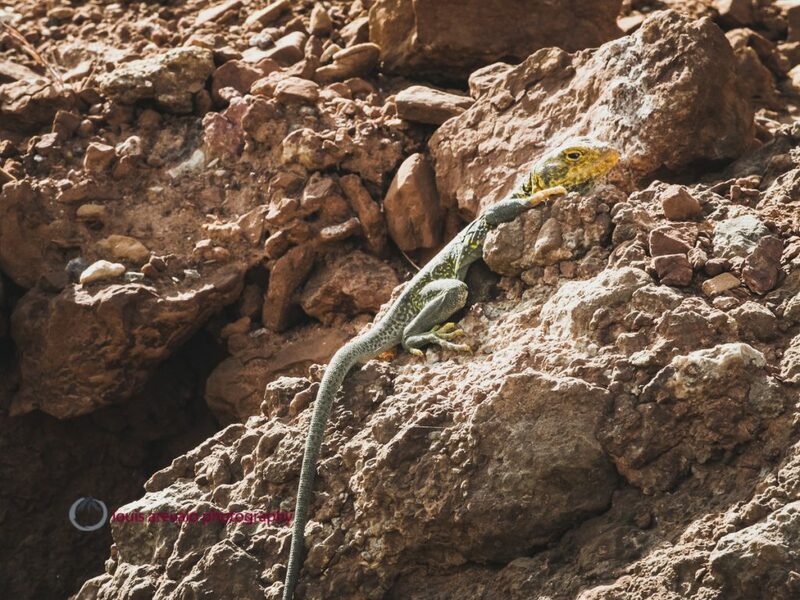 Collared Lizard, Colorado National Monument. Blueberry pancakes, PB&J sandwiches, and red wine. Confusion, clarity, then execution. Aching bones, endless thirst, and circling contentment. 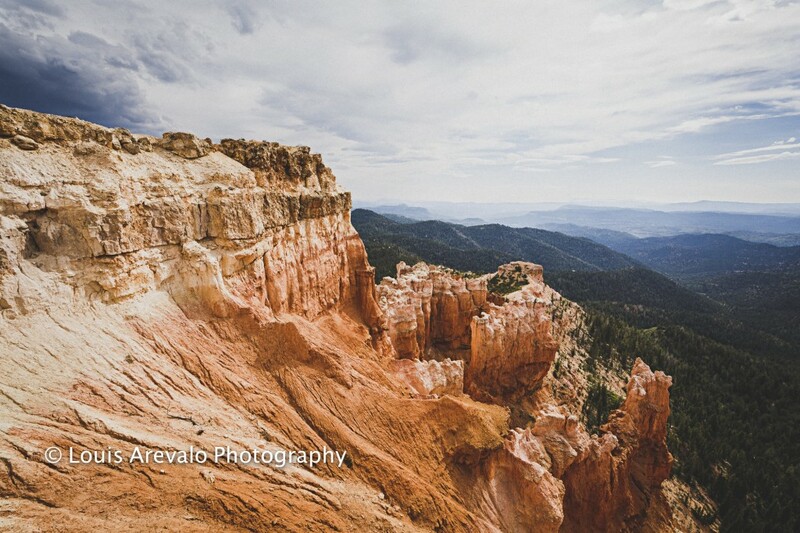 Shiho Kobayashi jumars back to the rim after climbing spires in Colorado National Monument. Silent sunrises. Whispering sunsets. I’m tired to the bone and it’s time to go home. Sunrise over Monument Valley from Window Rock, Colorado National Monument. 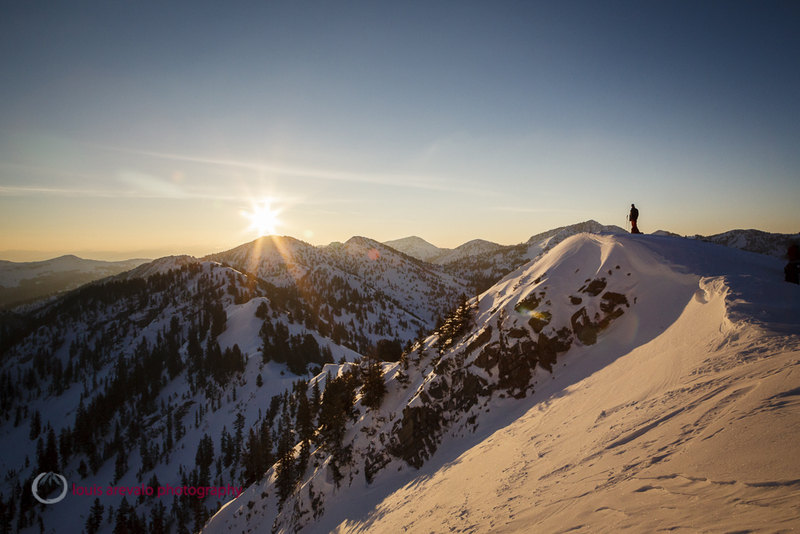 Splitboarder Maxwell Morrill boots his way to a wintery summit in the Wasatch Mountains of Utah. That’s not exactly what has happened, not even close, but there is something rewarding about getting out into the wild and coming back with something that isn’t recycled. 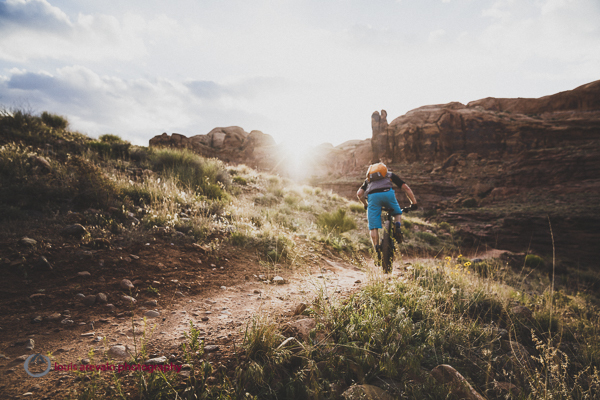 This essay first appeared in the pages of the Utah Adventure Journal. 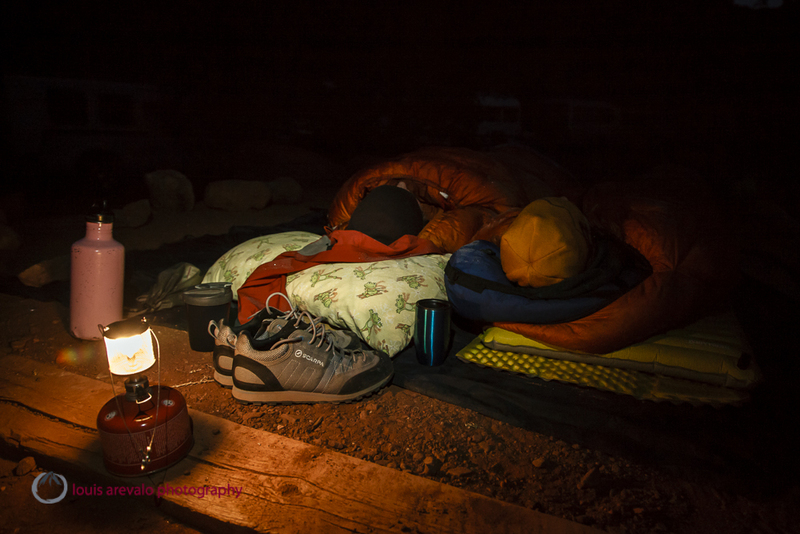 Charlie, Bowe and I had started the day in the half occupied Watchman Campground. After breakfast beneath the yellow cottonwood leaves we obtained a backcountry permit then found our way into Mystery Canyon. Following the government shutdown last September, where visitors were forced to make other autumn travel plans, the park felt vacant. 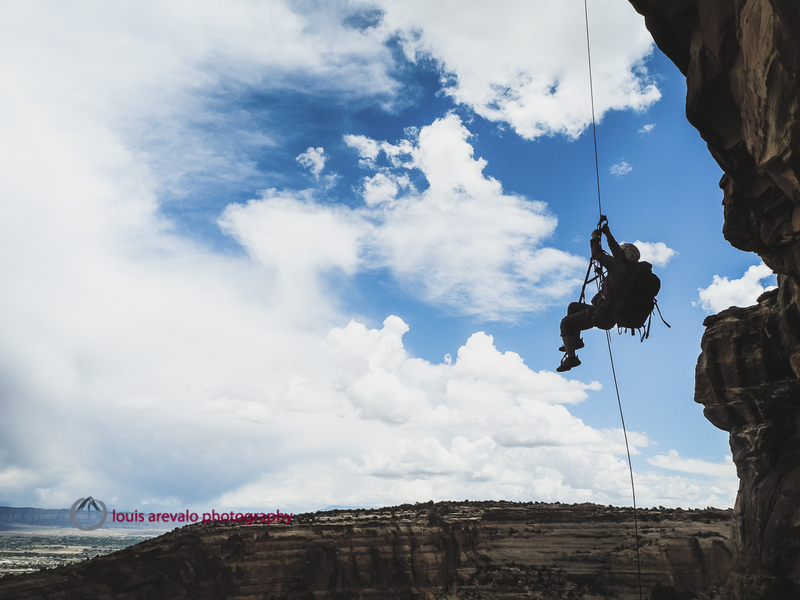 Hours later, after wandering through the solitude of a narrow fold in the desert; following eight rappels, a swim and plenty of wading, one final abseil remained to escape. The clock was ticking. I’d agreed to pick up my wife in the town of Hurricane at five. Perched 130 feet above the Virgin River in the shadows of the November afternoon Charllie threaded the anchor then Bowe tossed the rope. I watched as its coils butterflied open between walls of water-carved sandstone. Wading the final leg of the trek five o’clock came and went. Ignoring the sunset sky, I stepped out of the river, peeled off my wet suit, and began jogging toward the car. Charlie rapping in Mystery Canyon, Zion National Park. The clock read six as we pulled up to the dark factory. Headlights illuminated the doorway and Jacki’s solemn face appeared. “I’ve decided to work tomorrow,” she announced over dinner. She was not happy. Sometimes this happens. 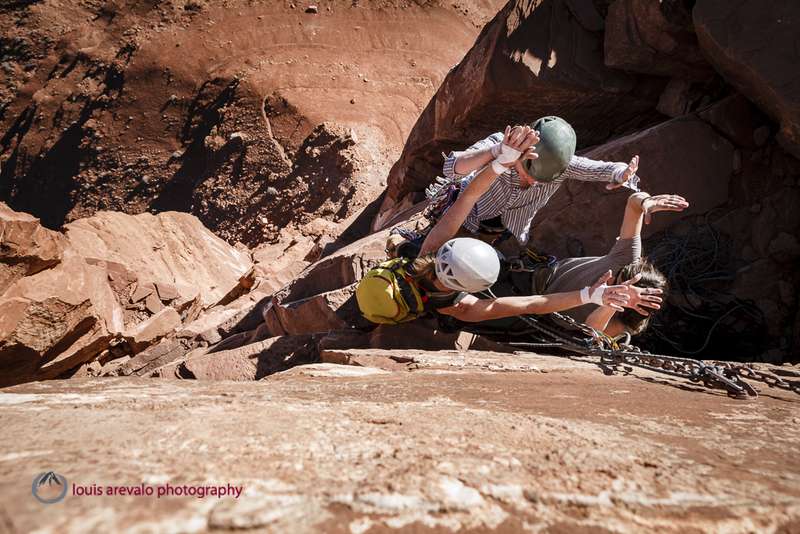 When asked if we could talk about it she simply said, “later.” Our relationship, like climbing, is not always easy. 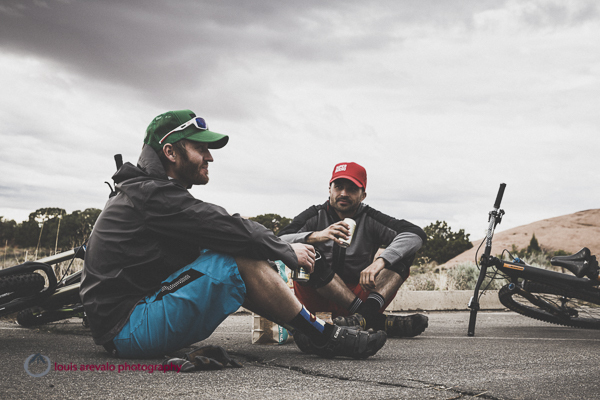 The day prior to Mystery Canyon, Charlie, Bowe and I had bushwhacked through sage, salt and rabbit brush, eventually finding our way to the base of the Watchman and a route named The Vigil. 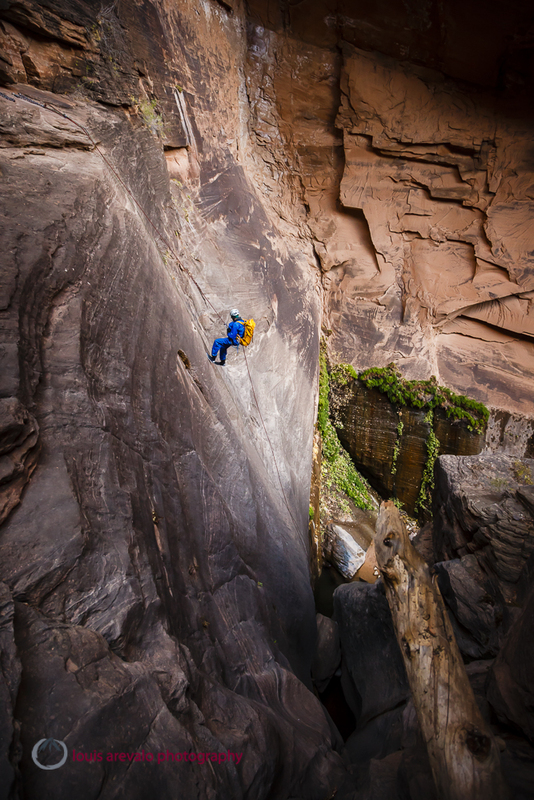 The initial pitch began as many Zion routes do, moss-covered, sandy, loose and awkward, but somehow it was manageable. The off-angled fist crack of the second pitch looked intimidating, but with a little work it unfolded. 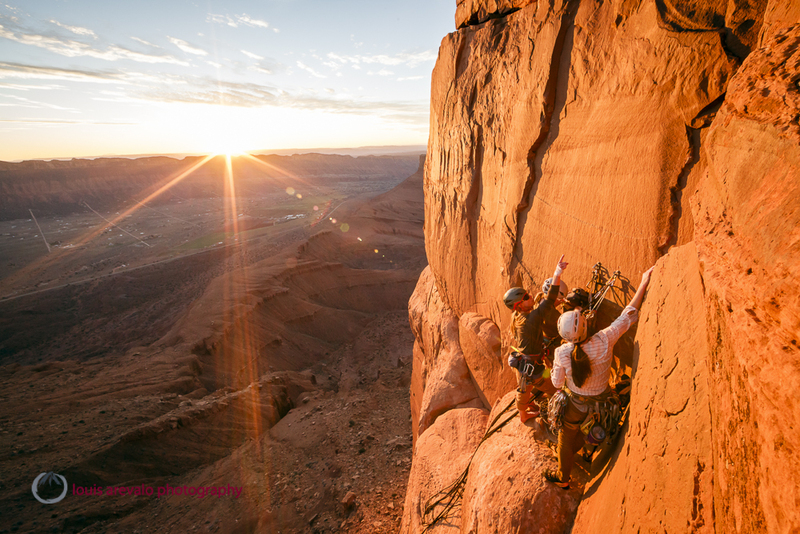 During the third pitch, which cast out onto wild features in the Navajo sandstone leaving the crack behind, the sun crested the summit of the Watchman and began warming the rock. Then we hit a snag. The first of two dead ends had me climbing a flared, lichen-filled crack that I repeatedly greased out of. The second involved traversing over a section of loose blocks to access a fingertip dihedral. 30 feet higher the seam petered out with nothing on the horizon. Slowly and deliberately I made my way back to the belay. After consulting the topo and I discovered an unlikely escape to our right bolt out right. 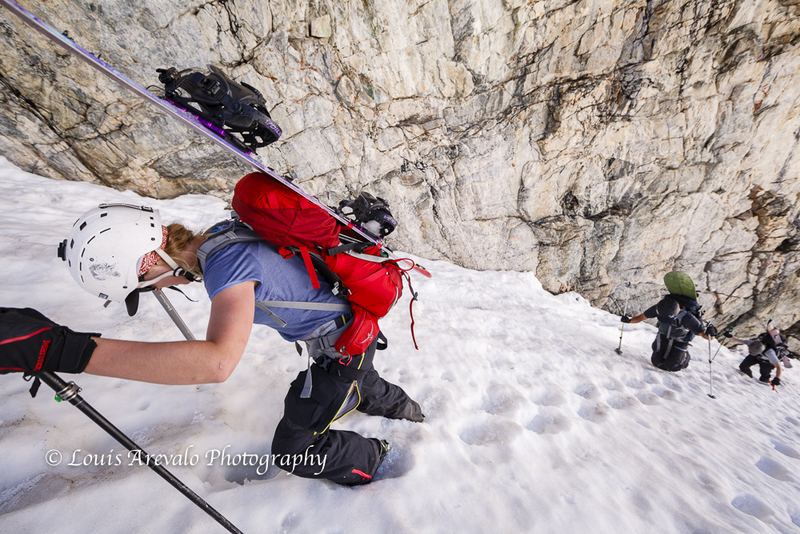 Heads-up, run out climbing on delicate patina edges and shallow cracks put us back on track. Dirt and brush rained down the cliff as I clambered to the shelf above. 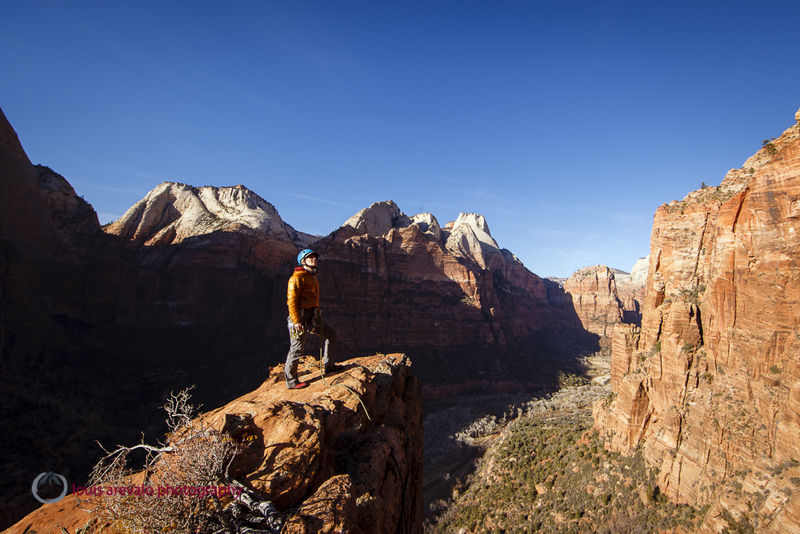 Charlie throws the rope on the Watchman, Zion National Park. From the halfway ledge on the Watchman we sized up the five remaining pitches. In the light of the setting sun the stone appeared immaculate. Below the village of Springdale hummed with traffic, the cottonwoods lining the Virgin River shimmered with golden leaves and the park’s canyon walls held an inviting glow. A late start followed by a longer than expected approach combined with my poor route-finding skills equaled we’d run out of time. Without a word we exchanges a look then descended. Rock Lobster, Indian Creek, Utah. I first met Jacki during a weekend trip to Indian Creek. I recall thrashing my way to each set of anchors only to have her come along and casually float up the cracks. What had taken me half a life to obtain as a full time devotee, Jacki appeared to have been born with. Over the course of the weekend I learned she was a recent divorcee, mother of two and had just begun climbing. She was way out of my league. Friday in Zion, after delivering Jacki back to the factory, we pulled the car over near the entrance to the Mt Carmel Tunnel. Bowe wanted to photograph Charlie and Paul climbing so I offered to rig the rope up The Headache, a classic three-pitch route. I reached my hand into the splitter crack and flexed. The sandy grains set into my skin and I stepped up. Shuffling quietly through a wider section, letting my feet do most of the work, I noted the wavy nature of the rock then changed corners and settled into the belay. Bowe followed, occasionally sagging onto the rope to snap frames. Across the way shadows swept their way from left to right along the flanks of East Temple Peak. 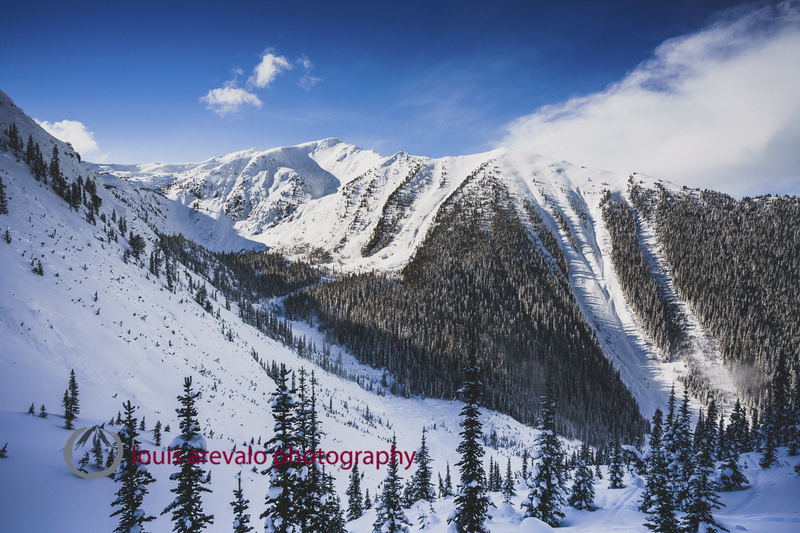 Below, cars crawled up the road, winding their way through hairpin corners before vanishing into the mountain. I could hear the camera’s shutter open and close. Lichen on Navajo sandstone, Zion National Park. More than half a year passed before I mustered enough courage to ask Jacki out. One of the first dates was a weekend in the Tetons. The forecast called for afternoon thunderstorms so we settled on an alpine start. Morning light hit the tents in Garnet Canyon as we walked quietly by. Above the Caves, up the talus, we found our way onto the folds of golden quartz and grey gneiss of Irene’s Arête. Swapping leads we made our way quickly and quietly up. Scurrying along the knife-edge ridge as it joined the main body of Disappointment Peak the clouds that had been filing in from Idaho became energized. Carabiners buzzed and hair stood on end. Without a chance to enjoy the top Jacki and I dashed down the decent gully. 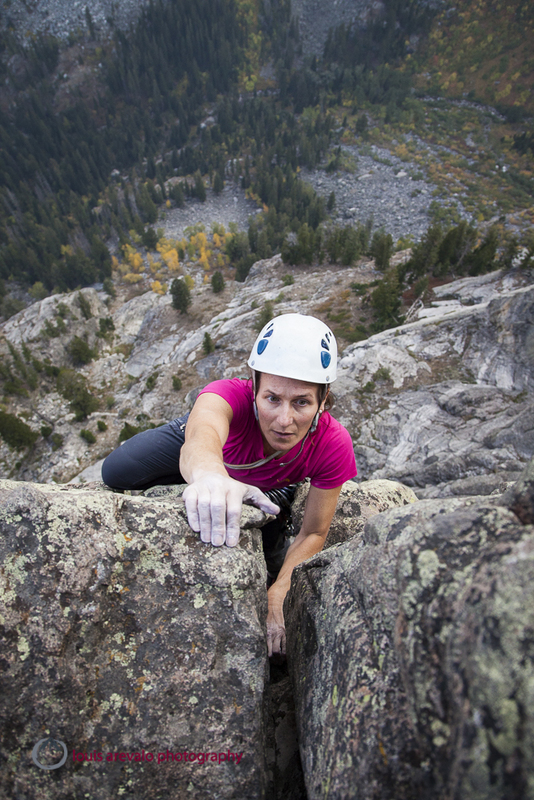 Jacki topping out on Dihedral of Horrors, Death Canyon, Grand Teton National Park, Wyoming. The next day in the Tetons the weather had worsened so we hiked. From a perch among ancient spruce trees Jacki and I looked down to Phelps Lake. The sky flashed white followed by a clap of thunder. Turning from me Jacki spoke. “You should move to Jackson.” The wall of mist, obscuring the mouth of Death Canyon, rolled toward us. Cool drops of rain penetrated the thin canopy above. “Someone like you shouldn’t be tied to me and the kids. You should be here, in these mountains…” Water dripped from her chin. 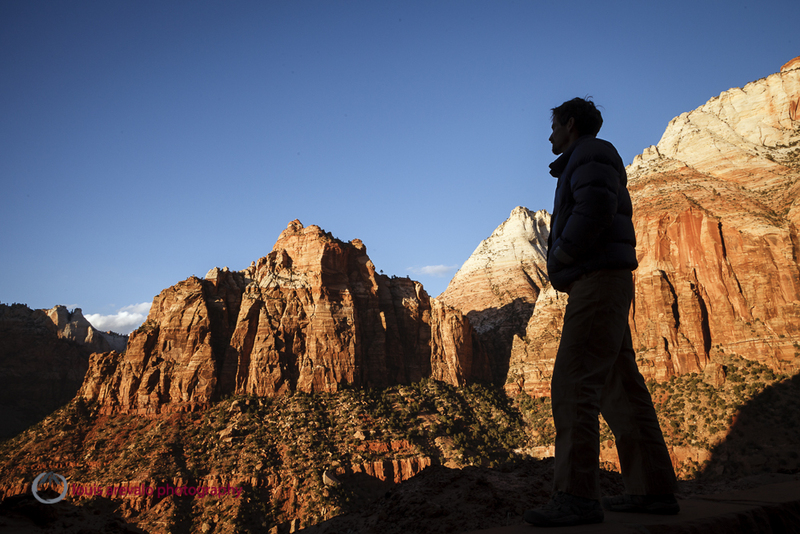 Jacki reluctantly joined our group Saturday for some Zion cragging. Blowing from the west the wind pounded us at the Confluence Crag. As part of a group of five, Jacki and I avoided sharing a rope. 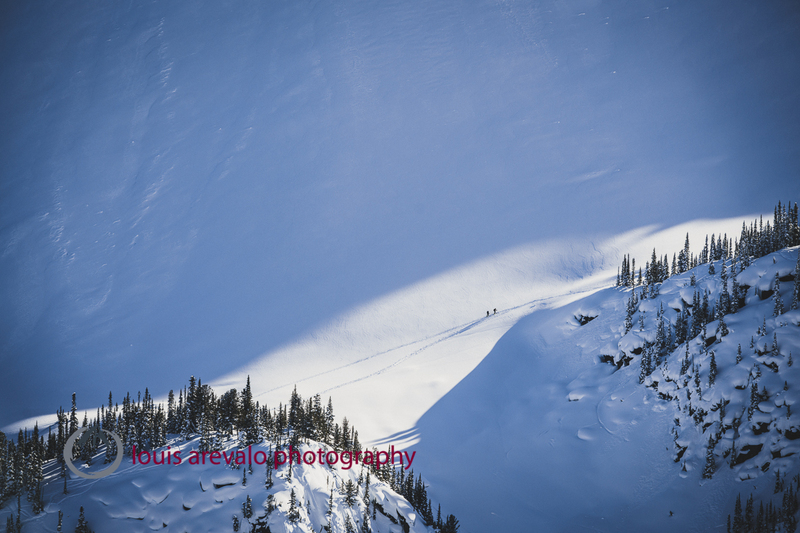 After a quick lap on Salty Dog Arête, Gunslinger and Crimson King, Jacki chose to leave when Bowe and Paul announced they’d had enough of the wind. I was not invited. Feeling left behind I continued climbing with Charlie. The wind tugged at the rope incessantly while we explored the two pitch bolted line named The Tribute. Large elephant ear holds aided in not being blown off as we scrambled to the top of the climb. I threaded the chain then Charlie threw the rope. We watched as the wind bustled it into a twisted mess. Charlie lowered himself down, cleaning the rope from its tangles one foot at a time. 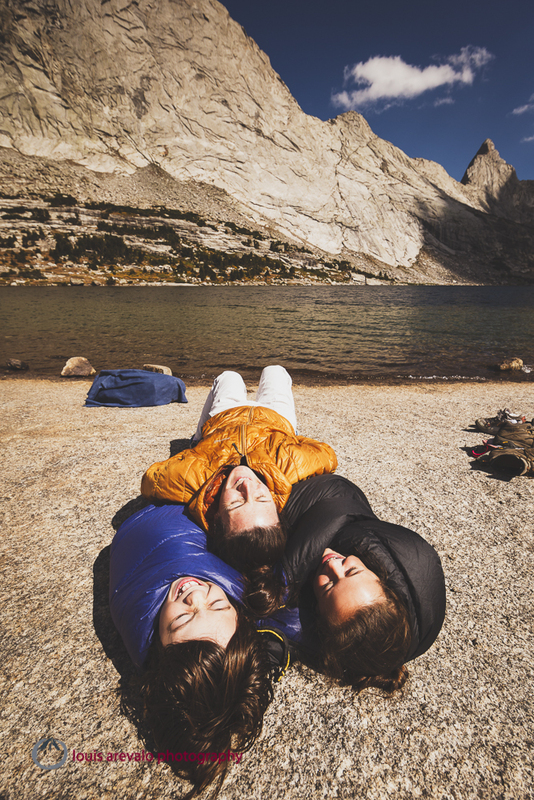 Fynn, Josie and Jacki on the shores of Deep Lake, Wind River Range, Wyoming. After five years full of wrong turns and plenty of backtracking, but double the amount of happiness, Jacki and the kids allowed me to join their family. Under an autumn sky in Salt Lake we fastened our hands to the kid’s in a union where we promised to listen and understand. Arriving to the second belay. The shuttle bus was nearly empty when we boarded at the visitor center. “I can’t remember the last time we did a route together,” Jacki spoke over the announcements. I couldn’t either. Getting off at the Zion Lodge we found a trail among cactus and beneath limbs of gamble oak. Flaking the rope at the base of “Made to Be Broken”, a five pitch bolted route on the Carbuncle Buttress that requires no gear other than quickdraws, Jacki was skeptical. It had been described as quality face climbing containing run-outs on delicate rock. I saw it as having set anchors that would be easy to bail from. “Let’s find out just how hard it can be,” I suggested. “We’ll just take it one pitch at a time,” she reminded me. High up on pitch three. Leaving the ground I high stepped my right foot then rocked up committing to a meandering path from bolt to bolt. 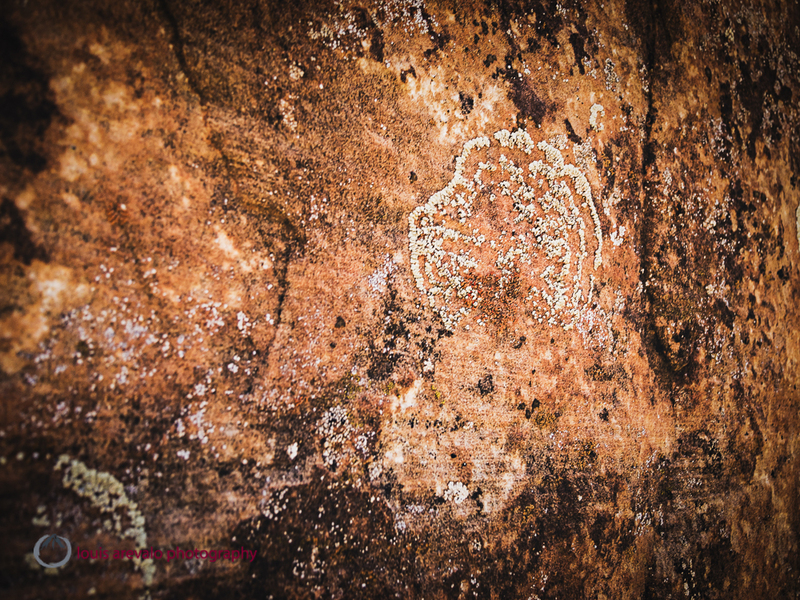 Smooth, clean features emerged from the lichen-covered stone revealing the way. Jacki, who stands 62 inches tall, struggled to leave the ground. After several attempts to smear her feet high she accepted a boost from the rope then eased her way up. At the end of the first pitch she reluctantly weighted the anchors. “I hate hanging belays,” she shuttered. I wrapped an arm around her. “Should we rap or do you want to see about the second pitch?” I told her it was up to her. She studied my face then after a few deep breaths nodded and we continued. The sequence above the belay, out right then traversing left, unsettled me. Stepping up then down repeatedly my legs began to quiver. Reverting to a common saying when climbing together, knowing that she would have no problem following, I quipped, “Come on Jack. How hard could it be?” She smiled and I went on. Joining me at the next anchor her worry was gone. From there our conversation tapered being replaced by the movement and exposure. Tension, frustration, and anger were released and floated freely up the rust colored walls. Right foot, left foot, right hand then left. It could have lasted ten minutes or ten hours, but after losing track of time the five pitches were suddenly below us. For a brief moment we were surprised to be standing together on the prow of the Carbuncle Buttress soaking up the autumn sun. The summit of Carbuncle Buttress. 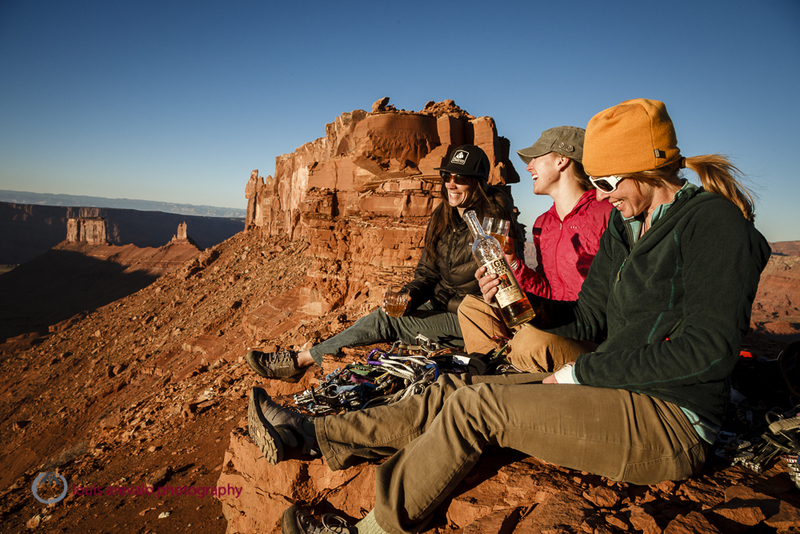 This story first appeared in the pages of the Utah Adventure Journal March 2014. Friday evening November 8th, 2013 Jewell Lund and Kim Hall were crushed into the backseat of my station wagon while Julia Geisler was snuggled up front. The rest of the car was bursting with boxes, gear and whatever else three ladies and a guy needed for a weekend of climbing and foolery. I’d offered to drive to Castle Valley and assured everyone that all four of us would fit. And we did… just barely. When the women invited me along to photograph this trip, where they planned to climb desert towers, practice yoga and enjoy cocktails, all on the rocks, I was a bit uncertain what I’d signed up for. They told me it wasn’t going to be a weekend filled with cutting edge ascents or futuristic ratings and that was fine by me. Sure, there’re many people setting themselves apart by pushing the limits of the sport through amazing feats, but really, how does that relate to me or you and the majority of people participating in climbing? So with the car riding low we made our way south, out of Salt Lake, and into the autumn night hoping to find something that we could all share. Blue skies greeted us Saturday morning in Castle Valley. Camped among the junipers we watched sunlight wash its way down the exposed faces of the sandstone formations of Castleton, the Rectory, Nuns and the Priest. Sometime in the night Julia’s boyfriend, Blake Summers, had arrived. Between sips of coffee and bites of breakfast burrito he and I arranged to climb together with the intent of staying just ahead and out of the way of Jewell, Kim and Julia. For that day the girls chose the fists, hands and fingers of the classic route Fine Jade located on the south end of the Rectory. 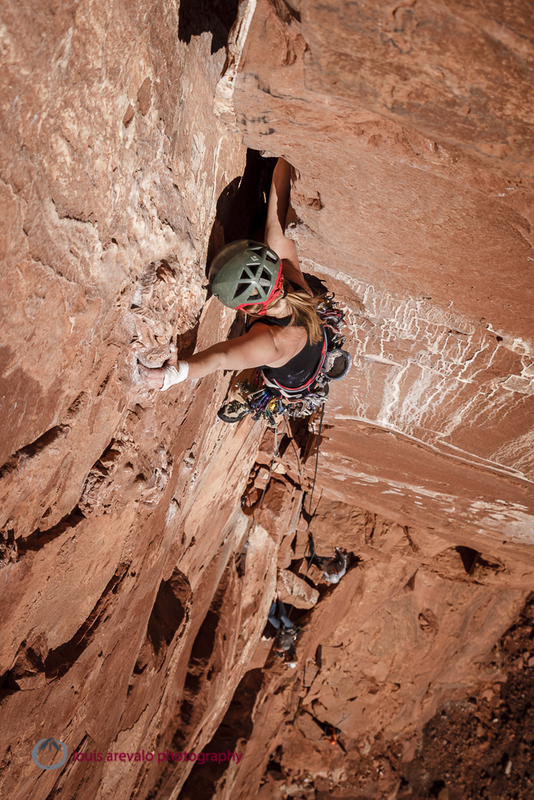 Kim Hall pulls above the initial crux of Fine Jade, The Rectory. 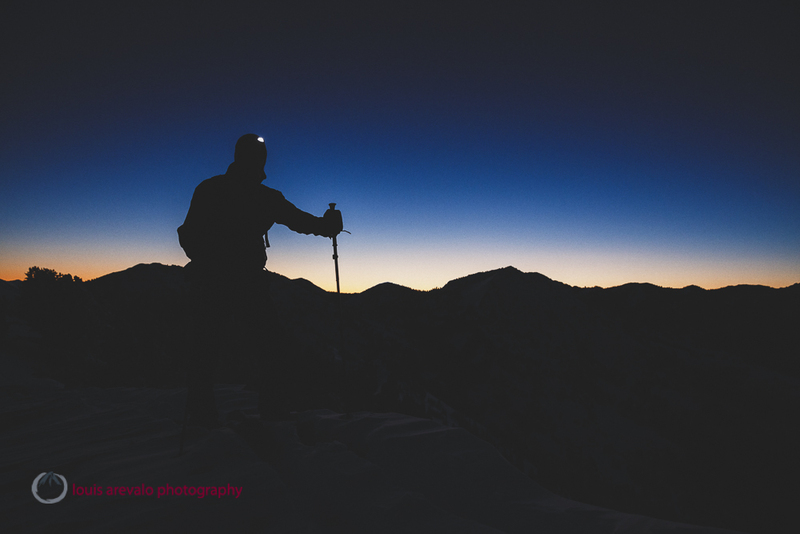 With the sun soaring low along the horizon I dangled from a rope fixed at the top of the first pitch and made images of Kim climbing. Shadowboxing her way through the tight hands section of the initial rope length I felt envious; her hands sank into the crack where my large mitts had been denied. 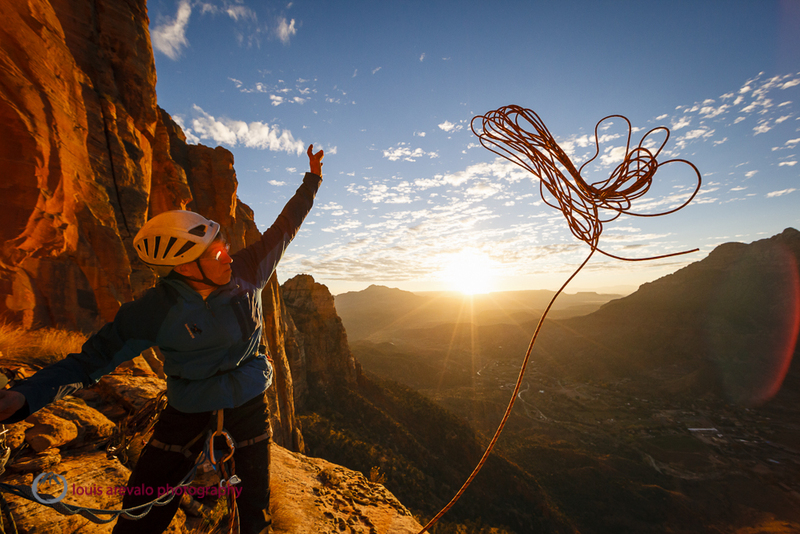 Next, with wisps of strawberry-blonde hair escaping from beneath her helmet, Jewell left the belay and moved up the second pitch. Following twin cracks she made her way toward a bulge that was split by a one-inch break. She plugged in a cam then clipped the ropes. Smearing her feet high she swung into a lie-back position then with little sign of struggle she fell. The cam held in the crack and the rope went tight as the harness cradled her at the waist. Jewell reaching the crux of Fine Jade, The Rectory. Falling was a good sign. Earlier Jewell admitted to not feeling very secure on sandstone. The majority of her climbing so far had taken place in the high country on the more granitic-type rock. Having tested the system she pulled herself back on and continued with more confidence. When she arrived to the end of that pitch she was beaming. As I belayed Blake and she belayed the two girls, we exchanged only a few words. The experience was written all over her face. Higher up on the pitch she found herself staring at a tipped out camming device with no other options for protection. Too nervous to weight the cam and not willing to climb down she took a breath and chose to go higher hoping that things would work out. By moving up she devoted herself to what lay ahead. Regardless of it being good or bad it was coming and she accepted that. Jewell let her worries go and was able to transform the process of climbing into a meditation on clarity. 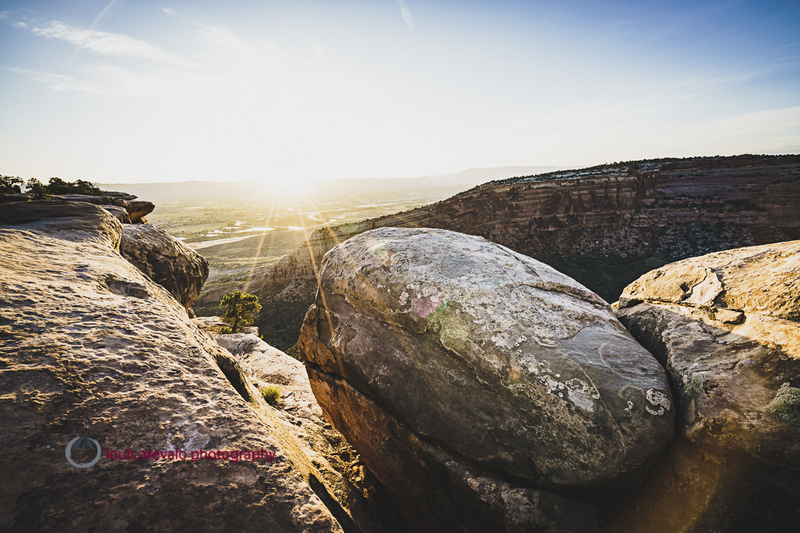 Totally engrossed and at the same time completely removed she was simply scaling a sandstone mesa in the setting sun with snow capped mountains to the south, water flowing in a river to the west and a waxing moon hanging in the sky above. Running out of daylight Kim ,Jewell and Julia discuss options, Fine Jade, The Rectory. 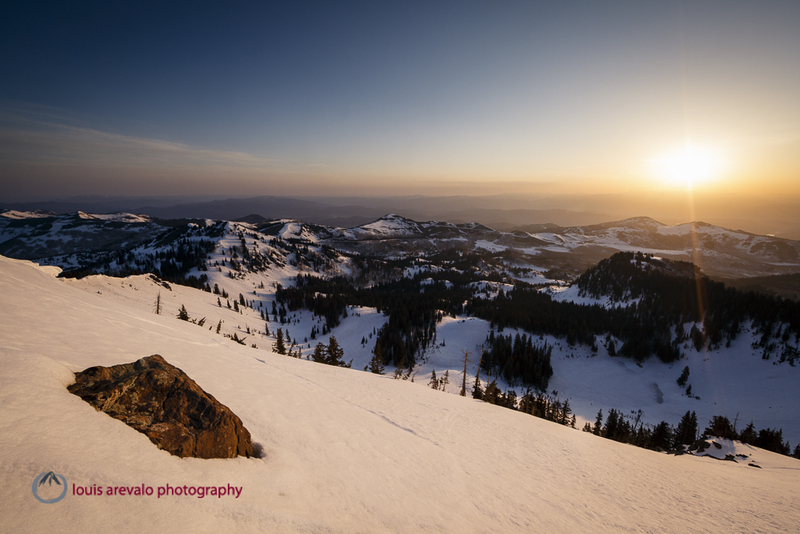 As the three ladies gathered at the top of the second pitch the sun winked out beneath the western rim. Thin clouds radiated above as house lights appeared along the distant valley floor. It was Julia’s turn. Her dark eyes read the rock above. She’d hoped to lead the traversing original finish, but rope drag and being out of sight from the belay were drawbacks. The more direct, shorter final pitch variation would fit her tall, dancer’s physique and although technically harder might be faster. “I’m not known for being bold, but it was my turn. My goal for the trip was to lead one pitch each day. Just step up and lead something and hopefully it would be easy,” Julia explained. Feeding off of Kim and Jewell’s infectious energy, she moved up in the fading light. Following a low angle corner the crack eventually petered out. She stood at the bottom of a bolted face twenty feet below the summit. Looking at tenuous moves with potential for hitting a ledge there were several minutes of up and down before Julia requested Blake lower a rope from the above. 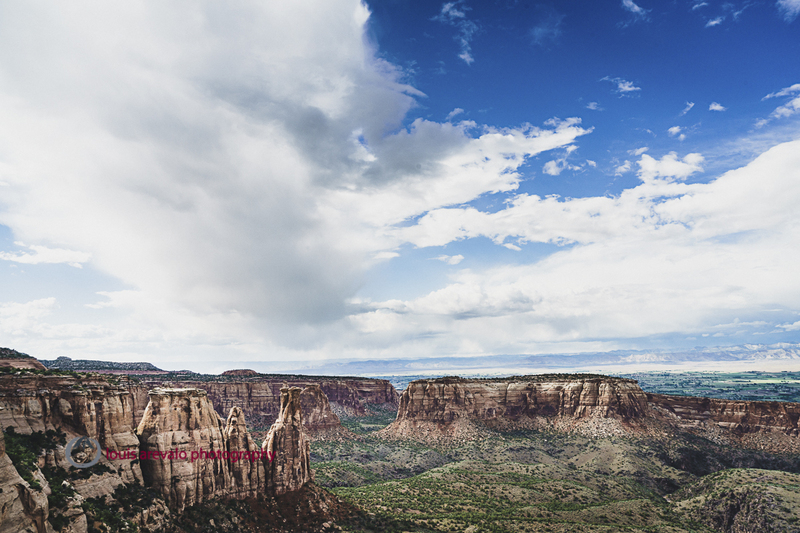 Standing on the summit I made out her silver helmet cresting the edge of the mesa followed by her smile. Once we were all on top the double rye was passed around. Between healthy pulls straight from the bottle laughter burst out as stars pierced the evening sky. During the drive down from Salt Lake Kim explained that she had some unfinished business on Castleton. 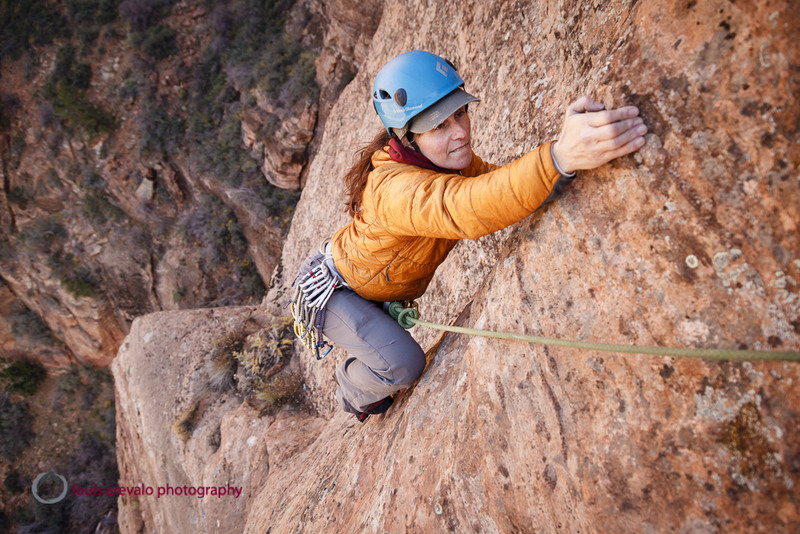 A few years back, in the valley for a friend’s birthday, Kim volunteered to rope-gun up the four-pitch Kor-Ingalls route. She handled the first two pitches well, but half way up the third pitch her momentum slowed. Despite the crux being bolt protected it still required committing, run-out moves. Seeing no other option but to lay it back, Kim’s confidence evaporated. After falling repeatedly she was spent. Luckily a party climbing the North Chimney, an adjacent route, was able to lower her a rope and help get her past the heady crux. Saturday night, after making our way down back to camp in the dark, a small fire illuminated the women’s faces. The day was relived with animated gestures, stories and jokes. Each of us agreed that despite having the easier rating, the first pitch of Fine Jade was definitely the crux. Over dinner it was decided that tomorrow we’d climb Kor Ingalls on Castleton and take care of Kim’s unfinished business. Rise and shine. Castle Valley bivy. Before dawn coyotes yapped to one another across the valley as I gazed toward the Big Dipper hovering over the black silhouette of the Castleton group. It had been years since my last visit here. Despite the numerous weekends spent here I still felt the allure of this place. I hoped the rest of the group was feeling it too. By six the water on the stove was boiling. With the stars fading and only a hint of light above the La Sal’s I placed mugs of coffee next to Kim and Jewell. They had slept out and the frost that now covered their bags shimmered in the light of the lantern. One knock on Blake’s car and Julia emerged bundled against the chill of the clear, November air. Continuing with her goal of taking the sharp end at least once a day Julia racked up for the beginning pitch of Kor-Ingalls. If she’d been fazed by the outcome of last night’s final pitch it didn’t show. In the full sun it was now warm enough to be in a t-shirt. Chimneying past stacked blocks, weaving in and out of the huge dihedral, she made quick work of the first pitch. Jewell handled the second. Then came the crux pitch and round two for Kim. Kim latches a jug after the tenuous crux of Kor-Ingalls. “You’ve totally got this! I’m right with you!” Jewell sounded from below. Kim had climbed her way to the crux, but after some hesitation was faltering. From above I watched her blonde ponytail sway back and forth as she scanned the rock for possibilities. “Actually, I don’t have it,” Kim responded, the stress obvious in her voice. She was on the verge of lowering down. 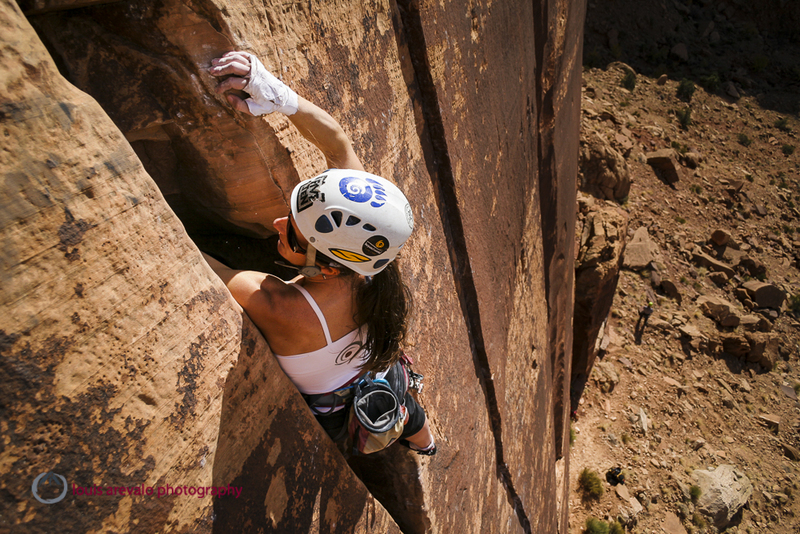 I’d been climbing around Kim long enough to know that this crux definitely fell within her ability. “Why don’t you give it ONE good go and if it doesn’t work I have an idea that might be helpful,” I offered encouragingly. After resting at the bolt Kim put the uncertainty on mute and committed. Pulling her right side out of the yawning crack she made a lie-back move that led to an arm-bar and pathetic left-hand crimp. Deliberately placing her left toe onto a polished, calcite knob she shifted her weight and stood up, pulling her right arm out of the crack. Rocking her body ever so slightly, once, twice, three times, she willed her left hand to bump. The meat of her fingers bit into the stone and her arm engaged. With the business beneath her she rested for a moment then moved on. Once she arrived to the belay I admitted to Kim that I really didn’t have any tricks to help with the crux. She laughed. All she really needed was the idea of an out before she was able to cast off. 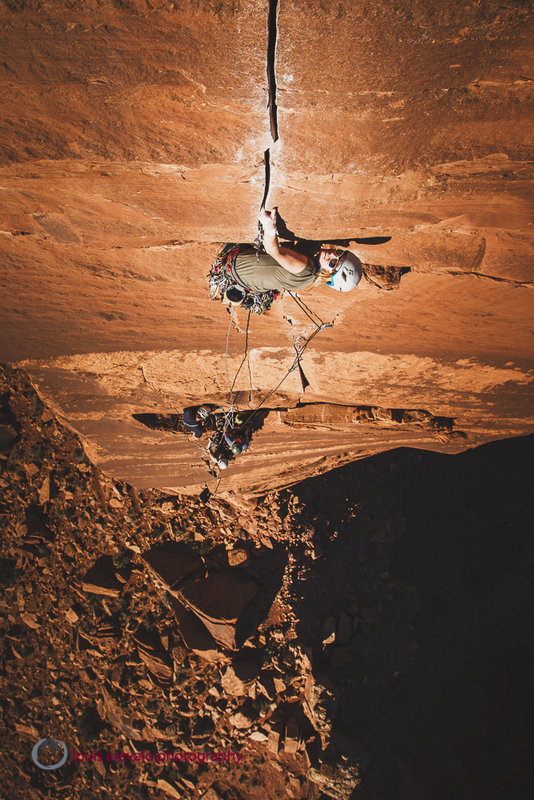 “The head game in climbing is the hardest for me,” Kim shared. 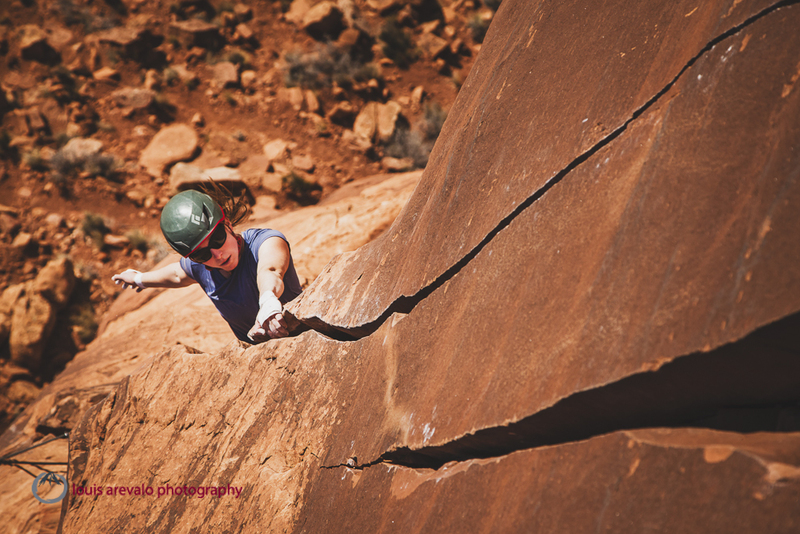 “I knew that physically I could climb it, but…” She didn’t need to finish the thought. The head game in climbing is hardest for everyone. With the final pitch below they celebrate on Castleton Tower. On the summit of Castleton, after leading the final pitch, Julia guided Kim and Jewell through a yoga practice while Blake lunched and I made photos. Hip openers followed sun salutations. Shoulders and backs were loosened then came heart openers. 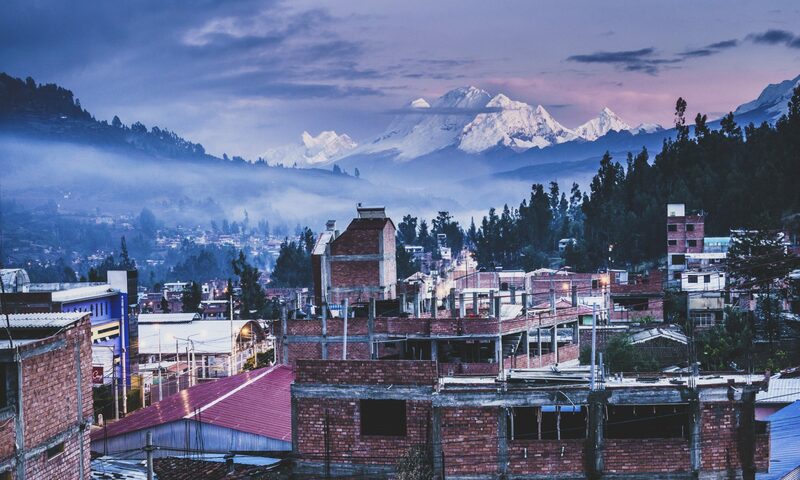 Ultimately the girls found themselves seated, gazing over the valley to the mountains. 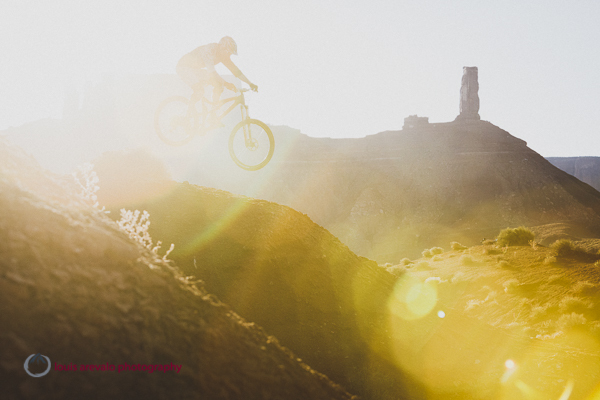 Beneath a comforting sun, perched on top of a pinnacle in the desert, they slowed down, brought awareness in and found the pulse of their surroundings. Seated yoga practice on the summit of Castleton Tower. Back at the tower’s base the girls mixed whiskey gingers, Blake coiled the ropes and I scrambled around with the camera pressed firmly to my face. Laughter floated lightly through a golden light. Afterward, as we weaved our way down through layers of sedimentary rock, boulder-strewn draws and smooth washes I listened to the red earth crunch beneath our feet. What was the weekend about? Fear, courage, and beauty shared with people cut from the same cloth. The weekend for me was not action at the forefront of climbing. Instead it was pure enjoyment at its heart. Whiskey gingers at the base of Castleton Tower. 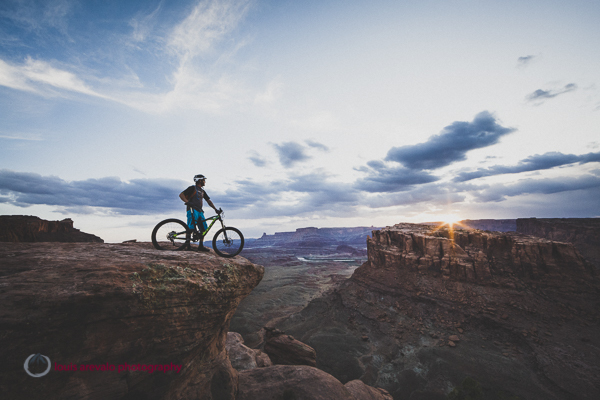 Getting there – Castle Valley is located about 20 miles Northeast of Moab, Utah. Follow River Road, State Highway 128, north of Moab. Turn right onto Castle Valley Road after passing mile marker 15. Follow road for 4.5 miles. Turn off for parking and camping will be on the left after crossing a cattle guard. Camping – Camping is allowed at the trailhead where there is also an outhouse. It is a dry camp so be sure to bring water. 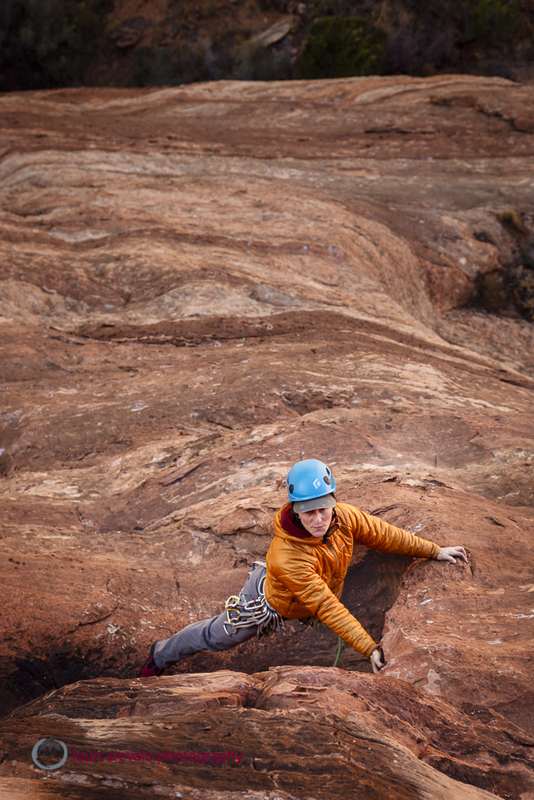 Guidebook – Rock Climbing – Desert Rock III, Eric Bjornstad, A Falcon Guide.